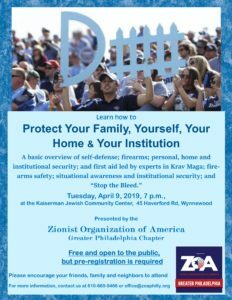 You are invited to attend a special workshop that Greater Philadelphia ZOA is sponsoring titled “Learn how to Protect Your Family, Yourself, Your Home & Your Institution.” The event will offer a basic overview of self-defense; firearms; personal, home and institutional security; and first aid led by experts in Krav Maga; firearms safety; situational awareness and institutional security; and “Stop the Bleed” emergency first aid. With acts of Jew-hatred increasing, it is important to have a basic understanding of good practices – just in case. 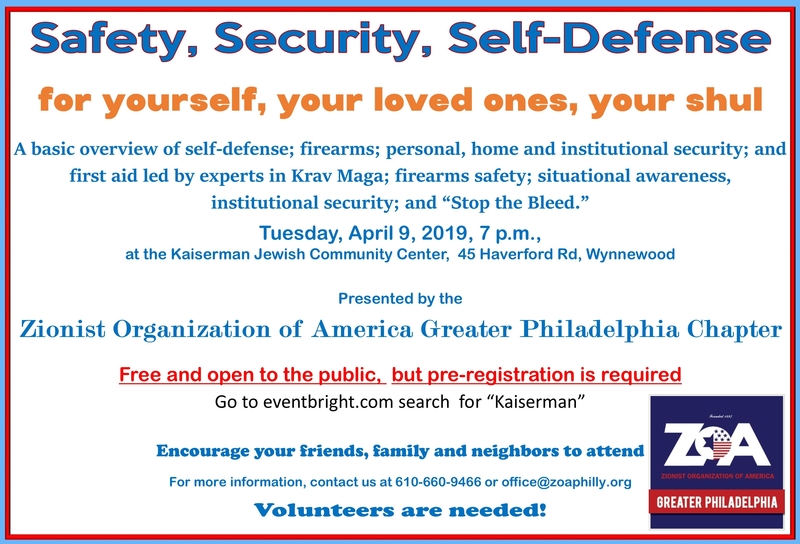 The workshop will take place on Tuesday, April 9, 2019, 7 p.m., at the Kaiserman Jewish Community Center, 45 Haverford Rd, Wynnewood. Please see the flyer below and share it with your friends, your email lists and social-media contacts. If you have any questions, please call our Office at 610-660-9466. Concerned about the rampant rise of Jew-hatred in America? Want to do something about it but you are not sure what to do? Concerned about the rampant rise of Jew-hatred in America? Want to do something about it but you are not sure what to do? mitigate it and combat it. relationship between Jew-hatred, anti-Israel activity and anti-Zionism, and what each of us can do. This can be either a public event for a congregation, community organization or a discussion group — or it can be a private parlor meeting in a home or office. ZOA is fighting back and working tirelessly. Jew-hatred, combat it, and gain support for Israel and the Jewish community. Despite the fact that the United States Embassy is now in Jerusalem, and other nations are beginning to follow suit or discussing the potential to move their embassies to Jerusalem, there are still those who want to divide the city, make it also the capital of a “Palestinian” state and deny and deride the Jewish connection to Jerusalem. Therefore, as advocates for Israel, each of us should help make the case that Jerusalem is central to the Jewish People and Israel, and why it must not be divided. 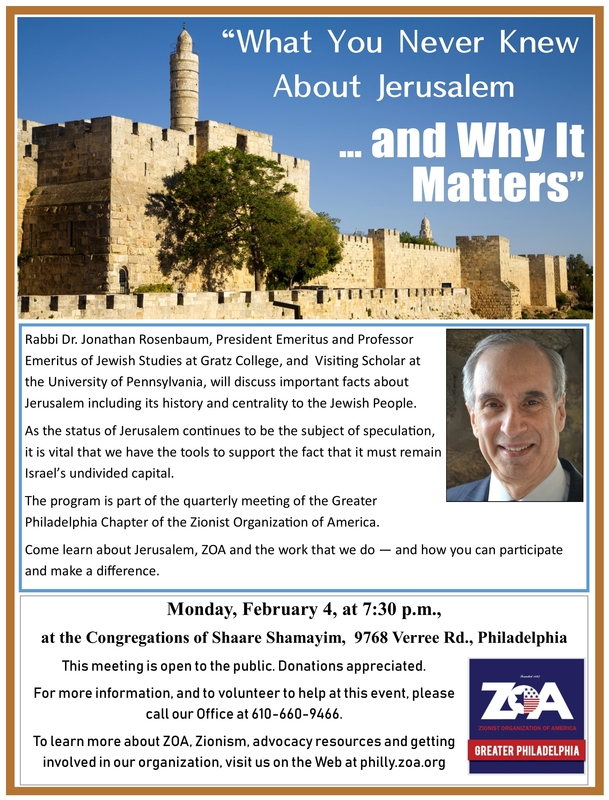 Please join us on Monday, February 4, at 7:30 p.m., at the Congregations of Shaare Shamayim for our next quarterly meeting featuring an important presentation and discussion with Rabbi Dr. Jonathan Rosenbaum. See the full size flyer below and attached. Also below is a full bio on Rosenbaum. We are also looking for volunteers to help out before, during and after the event. For those who may be coming from Center City, we have people looking for a ride. 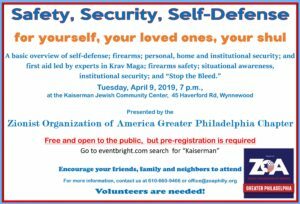 Please call our office at 610-660-9466 if you can help someone attend. Dr. Jonathan Rosenbaum, President Emeritus and Professor Emeritus of Jewish Studies at Gratz College, and also a Visiting Scholar at the University of Pennsylvania, will help us make the case for Jerusalem. He will explain our connection to Jerusalem – including facts that you were not aware of – and why it matters. So please join us for this event and encourage those you know to attend also. A full-size flyer is below and a PDF is attached. Please post on social media, print it and post it throughout the community, and send it to your email lists. Jonathan Rosenbaum is a prominent researcher, administrator, rabbi, and consultant, Dr. Rosenbaum has received academic tenure at three institutions, held an endowed professorship, and pioneered online and on-campus academic programs. As a specialist in the ancient Near East and in Biblical studies, he has taught and published in those fields as well as in rabbinics, American Jewish history, and Jewish education. Additionally, he has served as a deputy director of a major archaeological expedition in Israel. He studied at Reform, Conservative, and Orthodox rabbinical institutions, earned rabbinical ordination, and occupies the rare position of having served congregations and been recognized as a rabbi in all of those streams of Judaism. Rosenbaum’s work provides a response to anti-Israel rhetoric and anti-Semitism by presenting the conclusions of current Biblical and Near Eastern scholarship. Utilizing archaeology, ancient inscriptions, histories, chronicles, coins, and Biblical and extra-Biblical texts inscriptions, he documents the historical reality of ancient Israel and Judah from the conquest of Canaan to the fall of the Second Temple. In doing so, he allows primary sources and rigorous, scholarly analysis to refute misconceptions, errors of fact, and falsifications often espoused by supporters of BDS and others who oppose Zionism and the State of Israel. 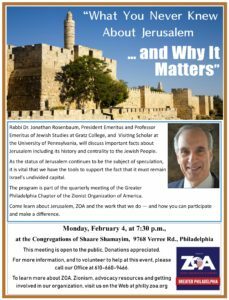 At our February 4 meeting, Rosenbaum will hone in on Jerusalem, giving us the background on why Jerusalem matters to the Jewish People and Israel, and to give us the tools to help each of us make the case for Jerusalem and why it must remain Israel’s undivided eternal capital. For more information, please call us at 610-660-9466 or email us at office@zoaphilly.org. 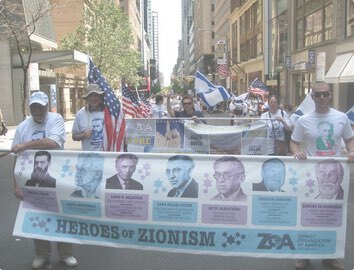 See Israel As Only ZOA Can Show it To You! 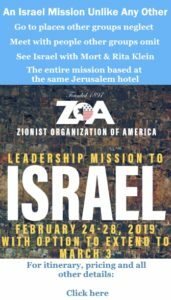 Register For ZOA’s Israel Leadership Mission! Time is running out to be a part of this once-in-a-lifetime Israel experience! The Israel Mission takes place Feb. 24-28, with an option to extend to March 3. 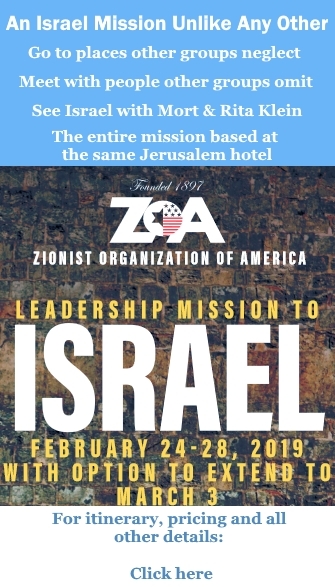 To lea rn more about the National ZOA Leadership Mission to Israel – including itinerary and pricing — click on the link below. If you have an interest in going, please call Howard at the National ZOA Office at 212-481-1500. If you’d like, we can put you in touch with people from our region who have participated in previous ZOA Israel missions.